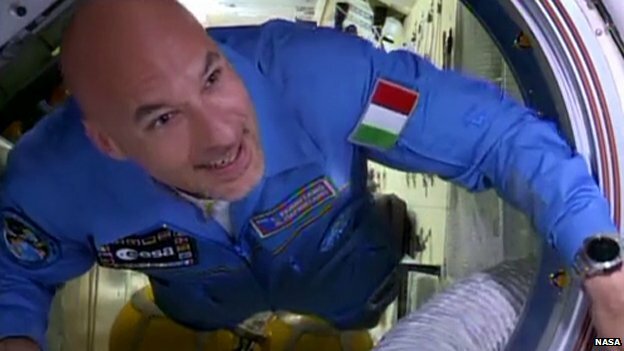 A fascinating story about the first experience of the Italian astronaut Luca Parmitano with Amateur Radio. Last week Luca Parmitano, had his first experience with a ham radio transceiver inside the ISS, and during a break, he was attracted by curiosity to turn on the radio and called “CQ Earth de IR0ISS”! I set the radio to the â€˜randomâ€™ contacts frequency, and without knowing what to expect, I put on the headphones. Physically, the International Space Station was still many kilometres away from the coastlines of Europe, but our horizon stretches out beneath us for thousands of kilometres and the various European ground stations could already see us. My ears were immediately overwhelmed by a cacophony of unidentifiable sounds and noises, voices, screeching and white noise. Then suddenly, a voice surfaced above the other sounds; it was a young man, in my mind barely more than a boy. He was calling the ISS American radio call sign (NA1SS) and repeating his own call sign. I was taken aback by the emotion that rose in me as I tried to reply to the call, using the Italian call sign (IR0ISS). But my excitement was nothing compared to the sheer astonishment and disbelief I heard in that voice, thousands of kilometres away. Speaking English with a beautiful Portuguese accent, the radio operator on the other side of the signal only managed to say a few wordsÂ â€“ â€œI donâ€™t know what to sayâ€¦ This is a dream come true for me!â€ â€“Â before our conversation was interrupted and buried by swarms of other calls.